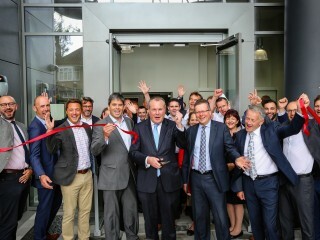 Bournemouth West MP Conor Burns joined in the celebrations on Friday 10 August 2018, when the 113 high-quality new apartments and multi-storey car parking including 155 public spaces at Berry Court, Bournemouth, were officially handed over. Together with the Leader of Bournemouth Borough Council, Councillor John Beesley, the MP was visiting the £27million Berry Court following a two-year build programme. The £27m development on St. Peters Road is close to the town centre and less than a 10 minute walk to the beachfront. It was built for housing provider Radian by Bournemouth Development Company, a public-private partnership between Bournemouth Borough Council and Morgan Sindall Investments Ltd. Construction was by Morgan Sindall Construction & Infrastructure. Guests were given an exclusive tour of the apartments, before Radian’s Executive Director of Operations Peter Evans officially received the keys.